When justice is constipated, fissures develop. Community and civil rights activists sought swifter justice for Jordan Miles on Thursday, urging the arrests of three police officers accused of beating the teenager this year. Must-read background to yesterday’s petition delivery the Courthouse appears in this week’s City Paper. That article’s hook is that the three officers on leave continue to get paid, including considerable “overtime”. That may seem wrong, but it should become clear that that much is inevitable — they have yet to be charged with any wrongdoing. Of course they’ve yet to be cleared of anything either, and therein lies the problem. A worrisome Catch-22 that I do not envy at all. Yet maybe it should highlight the importance of the city doing its investigation of the incident well and getting it right, so that there will be no direct contradictions — instead of the city waiting on the Feds, who may be concerned with broader or deeper aspects which would explain the time being consumed. Co-sign ‘peculiar’. This can’t be the first time a local government has faced this quandary. This entry was posted in Uncategorized on August 13, 2010 by Bram Reichbaum. 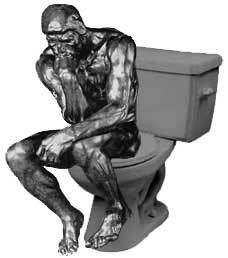 Thanks for photoshopping my greatest work with a toilet. If indoor plumbing was common when I made it, that is completely what I would have done.